Adios Dengue and Typhoid Fevers! So just as I was thinking I was on the mend a few weeks ago – Wham, I’m punched in the chest and thrown backwards in pain. My miserable body-mate, Dengue fever, had not moved out. Every joint and muscle screamed in pain. But this time I knew my body was too weak from trying to overcome this evil that lived inside me the last six weeks. So I crawled out of my darkened torture room and put out a distress call. Next thing I knew I was at a clinic getting my blood drawn. Ended up I had not only a devilish case of Dengue Fever, but in my weakened state had also caught Typhoid Fever. My blood was declared “sticky” and I soon became a twice daily inhabitant of the “drip room.” I tapped into a four hour drip of electrolights, in a small room full of outdoor lounge chairs and people in various states of unrest, all connected to drip lines. After four days of this, the pain was finally dulled. Unfortunately I had a mandatory Visa Run, so off I went to Bangkok. Basically an expensive five days of sleeping and shuffling to find food. I returned on a Wednesday and the shakes set in. My vision was blurred and I couldn’t concentrate on anything. So to my darkened room and sleep for another four days. Monday I emerged, hopeful that I could actually make it through a day of teaching. Although weak and shaky, my mind was clear and I managed to survive the day. It really helped that as the day began and the kids started arriving they would see me and with big smiles on their faces yell “Teacher Gretchen is back!” This filled me up and bolstered my energy. 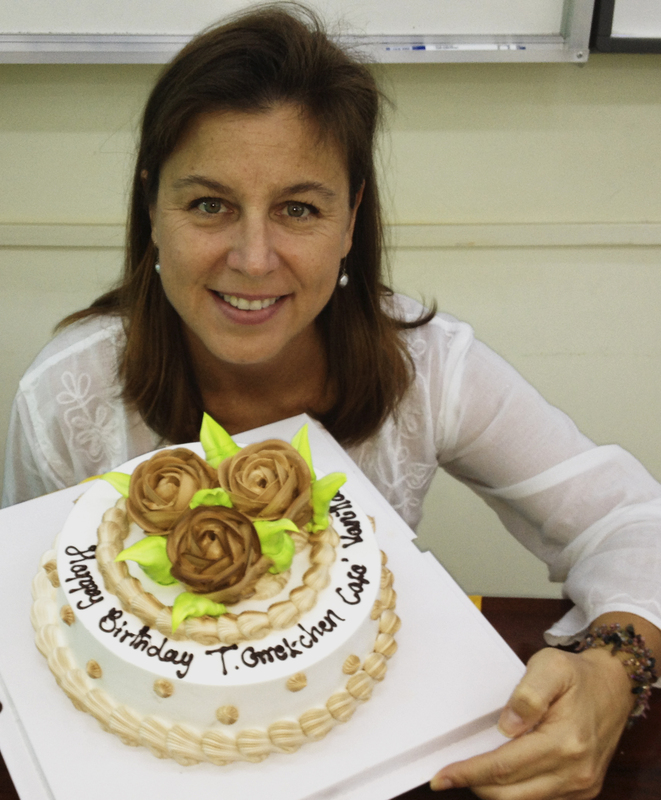 Then mid-way through the day a cake arrived to celebrate… me! Although my birthday is tomorrow, it was a lovely gesture and the sugar high kept me going for the rest of the day. Today is now Wednesday and although I still have a bit of the shakes, I am happy to report that I feel I am on the road to full recovery this time. So adios my evil passengers. Gretchen is back! A little pale and shaky, but love the cake! Wow! Glad to hear you are feeling better. Thanks Brian! Feeling great again! My gosh Gretchen. You are a trooper! Prayers around you for new strength each day. Love, Sandy And I’m so glad your birthday cake was so timely. . It is hard to believe that despite how sick you have been, you look great and still have that amazing energy and drive. Happy Birthday and may the rest of the year be full of health and happiness.